This one seems quite a simple image (it is!) but it was really important to me maybe for non-aesthetical reasons. This image called the attention of a band named Disgruntled Postal Workers, and they’ve asked me to use it in their CD called “Wicked”. It was the first time I was asked to have an image used on someone else’s work, and also… it was the first time I made some (really small) money off my work. I had to follow the rules and ask for a fee, but at the same time, I couldn’t ask them “too much”, mostly when I thought that it was such a simple image and more, made with a freeware software. Sure, it’s my artwork, but it could and can be easily reproduced by nearly anyone that knows a bit about fractals and Fractint. But this is what they liked, and they were not based in reviews or comments in fractal sites or art communities (here goes my anti-Deviant rant again). 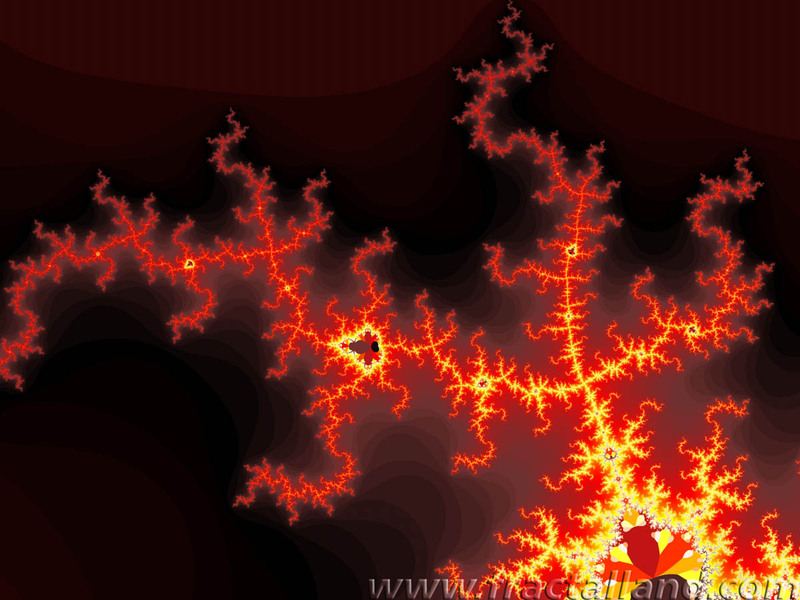 They just found the fractal image and thought it would fit with their work. And respectfully – the most important part of it all – they asked me for a licensing fee. And how much is too much in this case? I had no idea. I bought a book that helped me a lot to learn about how the licensing process of artwork goes, and it really helped me to decide how much to ask. It’s called “Graphic Artists Guild Handbook: Pricing & Ethical Guidelines“, and it covers all the aspects of licensing and fees and copyright issues, it helped me a lot, really (I bought the 10th edition if I’m not wrong). If they were signed to a big label, of course I could have made a lot more, but as they were an independent band, and as an amateur musician myself, I know how hard can it be to get money to help make your work to be finished and released to the public so if I asked them more than they could afford neither me nor them would be happy. The whole process ran as smoothly as possible – maybe because there was no involvment of the big guys of record labels or lawyers or anything like that. It was just a few e-mails exchanged between me and Scott (R.I.P.! ), the singer. I sent them a “contract” (written with the help of the book) just with the basics only to be sure that we wouldn’t have any problems in the future (what if they exploded and become a new U2 or something? ), and that’s it. After some time I got a package with the CD already finished, and there it was, my image, my name in the credits, in a rock’n’roll CD. It’s things like that that make you keep going. Oh yes and the CD was nice as well. It sounded like a mix of Rush and Live and with some influences of grunge and tidbits of “funk metal” or whatever it’s called. After Scott’s death, they have reformed with a new name, The Red Desert, sometimes I still go there and see what they are doing. And BTW, the fee was really small. I even made some “extras” for free, like images that could be used as wallpapers, postcards or some promotional stuff. It doesn’t hurt to do things legally, it’s better than use something off the internet without giving the artist any credits. Play nice. PS. : for those wondering how I could use a GIF image, with 256 colours, in a professional work – it was imported into UltraFractal and rendered there, in a big size and resolution and the colours were smooth as usual, no strips or bands or anything like that. As always, no Photoshop involved whatsoever.